CONCORD, N.C. (AP) — Wherever NASCAR is headed these next few years, Marcus Smith proved he deserves a seat at the head negotiating table. When the smoke from the post-race fireworks finally cleared Sunday, and Ryan Blaney had washed down his playoff victory with a champagne toast led by Smith and Charlotte’s loyal fans, NASCAR was able to sit back and celebrate a successful weekend. Had Johnson stayed in line, he would have moved on to the playoffs. But he hasn’t won in over a year and the race was at Charlotte, where Johnson won eight points races on the oval and was once unbeatable. He made his move on the final lap and it was a spectacular disaster. 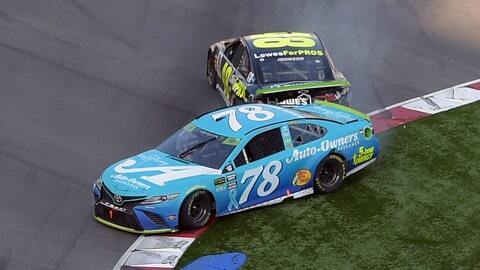 First Johnson wheel-hopped as he tried to pass Truex, then his car slid through grass and shot back out, clipping Truex and Blaney slipped by both for the victory. Blaney was in that mess, but backed out of it unscathed. It had to be equally weird for Blaney, the son of sprint car star Dave Blaney and a native of nearby High Point, woke up Monday and found his local paper celebrating the win by none other than “Dave Blaney.” Ryan Blaney wasn’t complaining; his dad was at the track for the first time in nearly two months and the entire family celebrated Ryan Blaney’s first victory of the season. Fans loved the All-Star rules (drivers did not) but Smith has focused mostly on what his customers are clamoring for. The roval provided something fresh and new, and Smith isn’t done pushing for more innovation.